afrol News, 19 June - A preliminary peace accord between the conflict parties in Mali was yesterday signed in Ouagadougou. The accord allows for a ceasefire and the peaceful holding of elections in all of Mali in July, also in areas controlled by Tuareg rebels. 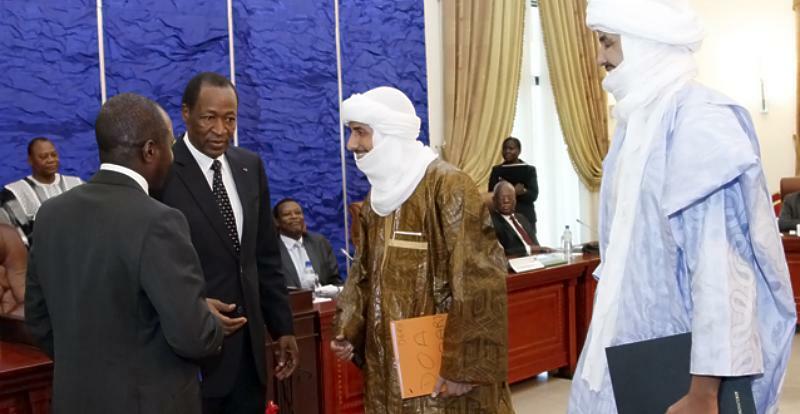 President Blaise Campoar� of neighbouring Burkina Faso led the ceasefire negotiations between parties to the Malian conflict. Except for the terrorist groups attached to al Qaeda operating in the Sahara desert, all the conflict parties did agree to an immediate ceasefire. This includes the non-elected interim government of Mali and several Tuareg militias. The principal aim of the ceasefire is to allow for national elections in Mali in just one month. With the holding of elections, Mali can finally move on with its necessary democratic transition following the March 2012 military coup that started the armed conflict in the country. Now, also the areas still held by Tuareg rebels can participate in the national elections. The peace negotiations were made possible by the near total victory of French, Malian and allied troops over the radical Islamist groups that last year had taken over control in northern Mali in alliance with the Tuareg militias. 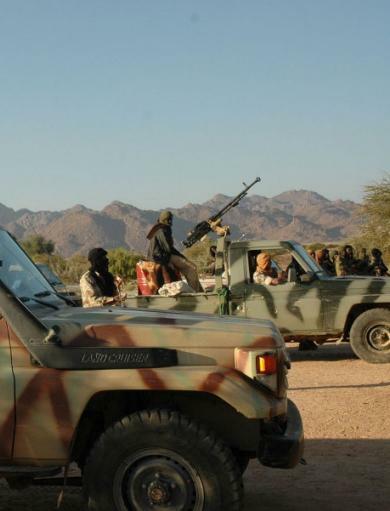 With the French-Malian military operation focusing on the terrorist groups attached to al Qaeda, the Tuaregs soon indicated their willingness to negotiate with the Bamako government. The French-led troops having, confined the terrorists into isolated mountain ranges in the Sahara, permitted the Tuareg militias to regain control of some desert settlements and towns such as Kidal. From this strategically important base, the Tuareg militias engaged in talks with the French and Malians, which resulted in the formal negotiations now completed in Ouagadougou. According to the ceasefire agreement, government security agents and international peacekeepers are allowed into Kidal and other Tuareg-held settlements to prepare for and secure the 28 July elections. The Tuareg militias meanwhile will stay in their barracks and slowly participate in a disarmament process. After the elections have been held and Mali finally gets a democratically elected and legitimate government, final peace negotiations between the new government and the Tuareg militias will be initiated. There, the Tuaregs will try to reach an agreement that gives them a greater autonomy in northern Mali. The militias in Ouagadougou already have signed up the the "territorial integrity" of Mali, meaning they have formally given up their aim of an independent Azawad state. Burkinabe President Compaor� at the ceasefire signing said that the agreement would help the making of "a prosperous Malian nation, rich by its diversity, unity and cohesion." Mr Compaor� also emphasised that the ceasefire must lead to Malians "mobilising to hinder the flow of religious extremism, terrorism, drug traffics and transborder criminality," which has been affecting the entire region, including his own country, Burkina Faso. The Malian ceasefire and progress in holding democratic elections was widely hailed during the last day. French Foreign Minister Laurent Fabius said that the "agreement represents a major step forward in resolving the crisis in Mali. With a view toward the presidential election on 28 July, it reconciles respect for Mali's territorial integrity and the recognition of a specific approach to addressing the problems in the northern part of the country." Catherine Ashton, the Foreign policy coordinator of the European Union (EU), said the Ouagadougou agreement was "of historic significance. It is a crucial step in the process of building peace through dialogue." The EU is among the main donors financing the democratic transition process in Mali and training Malian military troops. Bert Koenders, the head of the UN peacekeeping mission in Mali, called the ceasefire "a crucial first step." He emphasised that it now was "important that the signatories are looking to the future and continue their efforts, hand in hand, for a practical implementation of this agreement to begin immediately in a coordinated and peaceful manner," Mr Koenders said. Mr Koenders himself, has been given an important role in overseeing the ceasefire agreement. "I will chair an international commission to oversee the effective implementation of today's agreements, the success of which will depend on the political will of all Malian actors," the UN peacekeeper explained in a statement yesterday.